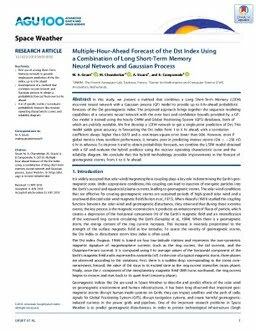 In this study, we present a method that combines a Long Short-Term Memory (LSTM) recurrent neural network with a Gaussian process (GP) model to provide up to 6-hr-ahead probabilistic forecasts of the Dst geomagnetic index. The proposed approach brings together the sequence modeling capabilities of a recurrent neural network with the error bars and confidence bounds provided by a GP. Our model is trained using the hourly OMNI and Global Positioning System (GPS) databases, both of which are publicly available. We first develop a LSTM network to get a single-point prediction of Dst. This model yields great accuracy in forecasting the Dst index from 1 to 6 hr ahead, with a correlation coefficient always higher than 0.873 and a root-mean-square error lower than 9.86. However, even if global metrics show excellent performance, it remains poor in predicting intense storms (Dst < −250 nT) 6 hr in advance. To improve it and to obtain probabilistic forecasts, we combine the LSTM model obtained with a GP and evaluate the hybrid predictor using the receiver operating characteristic curve and the reliability diagram. We conclude that this hybrid methodology provides improvements in the forecast of geomagnetic storms, from 1 to 6 hr ahead.